The conflict prevention configuration in the linear referencing system (LRS) can be edited by administrators with appropriate privileges to edit the LRS_Metadata table. 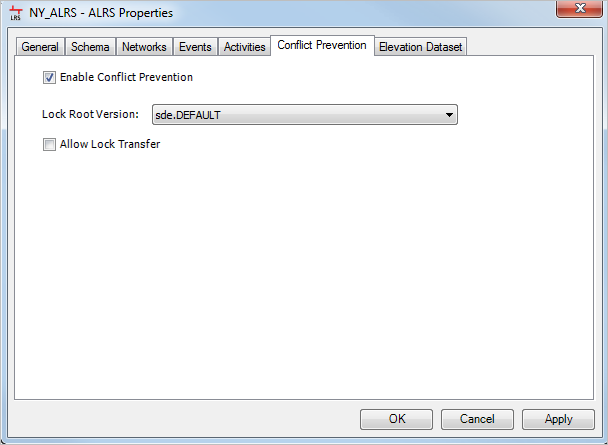 Conflict prevention can be enabled, disabled, and configured on the Conflict Prevention tab on the ALRS Properties dialog box. 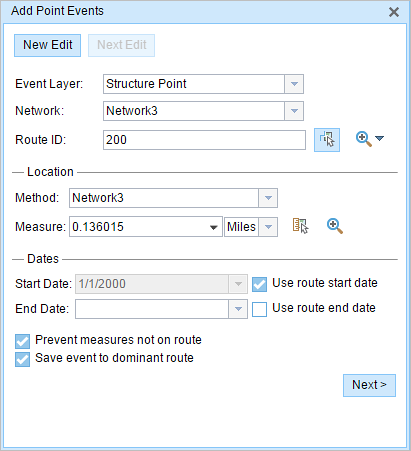 If enabled, users will be required to obtain locks on routes and events to edit them. When Creating a new LRS, you will have the option of enabling conflict prevention during the initial LRS setup. 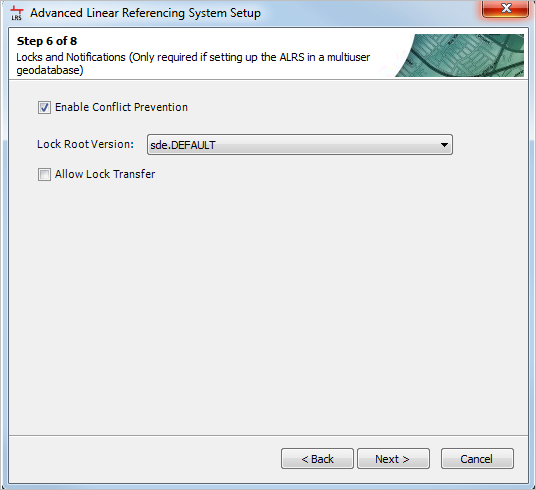 In step 6 of the ALRS setup, you can enable the conflict prevention settings and define the lock root version. Once conflict prevention has been enabled, all users of the enterprise geodatabase will be prompted to acquire locks on routes and events before performing any editing activities. The View Route Locks tool will be enabled on the Roads And Highways Editing toolbar, and the Edit Locks widget will be enabled on the Review tab on the Event Editor ribbon. If disabled, all locks will be removed and Roads and Highways will not coordinate editing via locks to prevent conflicts and measure discrepancies that may result from multiuser editing. As a result, the View Route Locks tool will be disabled on the Roads And Highways Editing toolbar, and the Edit Locks widget will be disabled on the Review tab on the Event Editor ribbon. When enabling and configuring conflict prevention, you must configure which enterprise geodatabase version to use as the lock root version. The lock root version is the version users must reconcile with in order to acquire locks or post to in order to release locks. It can be the DEFAULT version or a surrogate of DEFAULT. It is possible to restrict users from changing these configurations by not granting them write privileges to the LRS_Metadata table. Users who do not have write access to this table cannot change LRS configuration, including the settings for conflict prevention. If your LRS was created in a version prior to Roads and Highways 10.2.2 patch 1, you will need to upgrade your LRS to Roads and Highways 10.2.2 patch 1 to use conflict prevention. You will also need to upgrade your LRS to 10.2.2 patch 1. For instructions on upgrading the LRS, see Upgrading the LRS. Conflict prevention is only supported for enterprise geodatabases. It is not supported for file geodatabases. Browse to the LRS in the Catalog window. Right-click the LRS and click Properties. Click the Conflict Prevention tab. Check the Enable Conflict Prevention check box. Browse to the lock root version. Use the drop-down arrow to choose a version from which to reconcile and post edits. To learn more about managing geodatabase versions, see Creating versions and setting permissions. To enable the conflict prevention settings, you must be editing versioned data from an enterprise geodatabase.